We are an active, vibrant and friendly tennis club involved in new initiatives for tennis in 2016, such as the Davis Cup Legacy for which our Head Coach, Gemma Wiltshire, has been selected: "In November last year we all witnessed the Aegon GB Davis Cup Team writing their names into history by winning the Davis Cup by BNP Paribas for the first time in 79 years. The Davis Cup Legacy is about inspiring the next generation to pick up a racket and 2016 will give thousands of new children the opportunity to play tennis for free." www.lta.org.uk. ​Our Head Coach is also a trained Wheelchair Tennis Coach and runs a full 6 day a week tennis programme for aged 3 upwards. We are located in the recreation ground at Wrecclesham, just 1 mile from Farnham town centre. There are 4 hard courts, 3 of which are floodlit and one has a practice wall. Our modern clubhouse was built in 2012 with improved landscaping and new wheelchair accessible facilities. We welcome new members regardless of ability, with coaching available for all and run by Gemma Wiltshire, Head Coach of the Pin Point Tennis Team. Adult and junior teams are entered in the Aldershot and District League in both summer and winter seasons. Several tennis tournaments are organized throughout the year and club sessions take place twice a week when all members can join in. Social fundraising events such as the quiz, and annual dinner/dance take place each year. We have a stall at the Wrecclesham village fete in June and host introductory tennis sessions for school or other community groups during the summer months. The Club was reformed in 1967 on the site of a previous club which had existed in the 1930’s, when the only facility was one grass court. From a largely derelict site in 1967, the club expanded from originally two to three and then four all-weather courts. 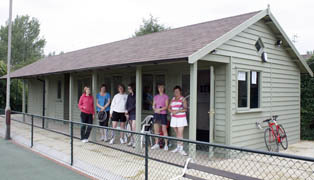 A large clubhouse, an old scout hut erected by members, was opened in 1974 and later floodlights were installed on three courts. In 2012 the old clubhouse was replaced with a new timber built clubhouse that meets today’s needs for a comfortable and pleasant place for members to enjoy. Do come and join us and make new friends while getting fit and healthy!